Delicious pea sized treats e.g. cooked chicken, dried liver or biltong. Prepare in advance and freeze in sandwich bags. A tug toy for toy crazy dogs or dogs that are not too food motivated. Allow your dog to tug on the toy when ever the programme tells you to give your dog a treat. Keep your dog on the lead whenever you leave your property. Keep your dog on the lead or locked away whenever you open your front gate. Never ever punish your dog for coming back to you even if he takes half and hour! Do not shout at your dog to get him to come to you at home or outside. Do not call your dog more than once when at home. i.e. call once then go and fetch him. Do not chase your dog if he is running away from you, rather run away from him. Reduce his meals by 1/3. Hungry dogs are loads keener when the treats come out. Do not give treats e.g. biscuits or titbits except when training. Reinforce your basic pack leadership rules i.e. who eats when, who owns what, who greets who and who has right of way. The principals behind teaching your dog to come back to you consistently is to teach him that not coming when called has grave consequences and coming when called has fabulous ones. It is also vital that your dog regards you as worthy of giving instruction – that is where your basic pack leadership rules come in. If your dog is sleeping on your bed, barking at you to make you feed him and jumping on you when you walk in the door, chances are he is not going to take you too seriously when you try to call him away from a fleeing cat or a great game with another dog. Here are some reasons why your dog may choose not to come back to you when called. At the park, he knows that he will be put back on the lead if he comes back to you. He has been punished for returning after running off. He is following his hormones (neutering and spaying are the solution for this). He doesn’t think you worthy of giving instruction. It is fun to get to do your own thing! Coming to you results in a treat and loads of praise. Not coming when called results in a reprimand and a yank (plus you end up having to listen anyway). Coming when called always results in being allowed to go off again. It is not the end of the fun. The sound of the lead unclipping is not a signal to run off. 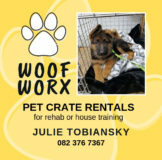 I suggest you contact Lynda Montignies 0848701002. She can steer you in the right direction. My dog is 3 years old and very well trained. I would like to improve his recall and general walking obedience and take his training to the next level. He’s an extremely fast learner and very dog friendly. Please advise on way forward. 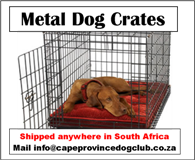 Mail me on info@capeprovincedogclub.co.za and I can let you know where you will fit in.